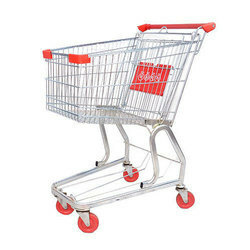 We offer a wide range of Shopping Trolley which is made using the premium quality raw material as well as metal. They are widely used to carry material in the supermarket, shops, and malls which provide maximum space utilization along with easy handling. These baskets are well known for their excellent load bearing capacity, durability, and Eco-friendly attributes.